Hello Aspirants, Territorial Army 2018 recruitment has been announced. Looking for Indian army entry we have a good news for you as Indian army as announced the recruitment for Territorial Army (TA) 2018- 2019 Interested and Eligible candidates can apply from the official website of Indian army on or before 30th JUNE 2018. For details regarding TA 2018 kindly read the complete article below and know more about Territorial army 2018 recruitment. for any questions or queries kindly comment below. Only male citizens of India and Ex-service officers who are medically fit. · Age- 18 to 42 years on the date of application. Education Qualification -Graduate from any recognized university. 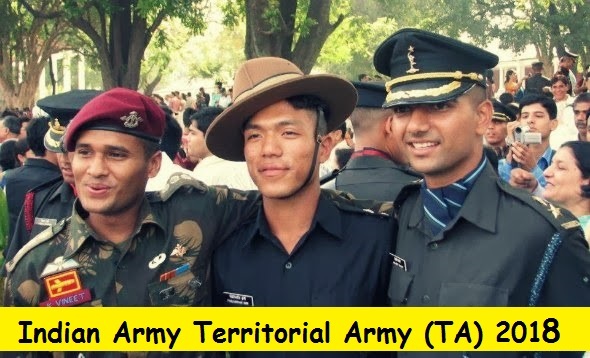 How To Apply for Territorial Army Recruitment 2018 – 2019 ? So this was all about Territorial Army (TA) Notification 2018 - 2019. Hope candidates have applied for the TA 2018 - 2019 recruitment. For more details regarding TA keep following us we would be updating page once its declared. For study materials keep following us we will update our page with information. For any questions on Territorial Army (TA) Notification 2018 - 2019 kindly comment below. What is qualification and age requirement for the post.